The Baruwa API allows you to manage a Baruwa Server in a programmatic way using conventional HTTP requests. The endpoints are intuitive and powerful, allowing you to easily make calls to retrieve information or to execute actions. 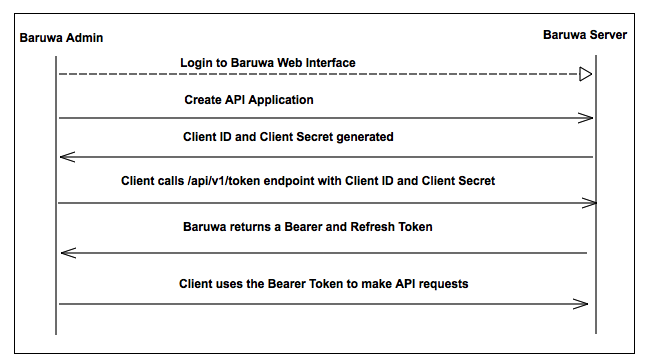 The Baruwa API is organized around REST and uses OAUTH 2.0 authentication. It is therefore possible to use off-the-shelf HTTP clients in any programming language. OAuth is an industry-standard open standard for authorization used by many companies to provide secure access to protected resources. The Baruwa API uses the OAuth 2.0 protocol to authorize requests. Register your application by logging into the Baruwa web interface, and by going to the API & Applications menu under the user account. You then obtain an access token for your application by sending a request to the /api/v1/oauth/token endpoint. You need to authenticate your access token request with your application credentials obtained as described above. The Baruwa server, acting as the authorization server, verifies your application credentials and returns Bearer and Refresh access tokens. The Baruwa API documentation is available online.